MAKING A STATEMENT AND LIVING BY IT ARE TWO VERY DIFFERENT CONCEPTS TO RECONCILE. AT TITAN, IT IS WHAT DEFINES US. OUR EMPLOYEES ARE REMINDED THAT THEY ARE CRAFTSMEN AND CRAFTSWOMEN BEFORE ALL ELSE. Pride in craftsmanship is our mantra. So what exactly does quality and craftsmanship actually mean? It’s an ongoing process that involves people at every level of production who take pride in what they produce. Nothing is taken for granted and nothing is simply passed along the line. 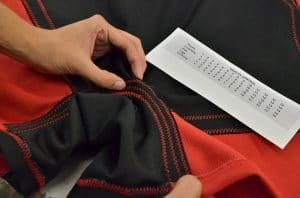 The process starts with cutters who first inspect every square foot of fabric and grade it, marking what is acceptable and what isn’t. This in itself is quite a job when you consider that the rolls of fabric are 1.5 metres long and often have 50 – 90 metres on a roll and weigh upwards of 68 kgs. Supervisors can and have rejected entire lots. Our sewing construction is focused not on speed of production but on what will make for the best performance of the product for the lifter. Instead of using faster straight stitch construction, we use a satin stitch because it absorbs stress better and makes for a stronger product. A perfect example of this entire process is the Centurion squat suit. This suit dominates on international platforms. It features our patented harness system that has produced an incredible number of world, regional and local records. In contrast to our competitors suits which are comprised of 3 panels, the Centurion is comprised of eleven different panels that when combined create our famed harness system. This suit takes up to 3 times longer than a conventional suit to produce and yet is competitively priced. We could produce a simpler, faster produced suit. But, we always go back to our guiding principles. 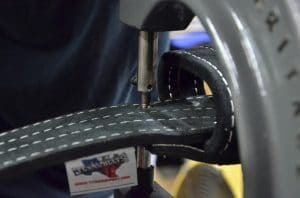 In crafting our selection of leather goods, we are diligent in procuring only the finest grade of hides in Texas. Each hide is carefully inspected for imperfections before undergoing the tanning process. “Wild West” between the local Comanche, Karankawa, Coahuilteco and Carrizo native Indian tribes with local settlers and the Mexican city state. Our leather goods are embodiment of our commitment to quality craftsmanship, whether it is the fine uniform stitching, skillful tanning or the high grade of hides we procure. At Titan, we do not compromise on quality or sacrifice performance for speed and sheer profit. That’s not what we’re about. We produce world class products that we’re proud of, products that we ourselves would choose to use.